(Friday) Wednesday Mr. S.W. Creek killed Mr. Bernard Mosby with a knife. --- Sad Tragedy. – A difficulty occurred in this county on Wednesday last, between Mr. S.W. 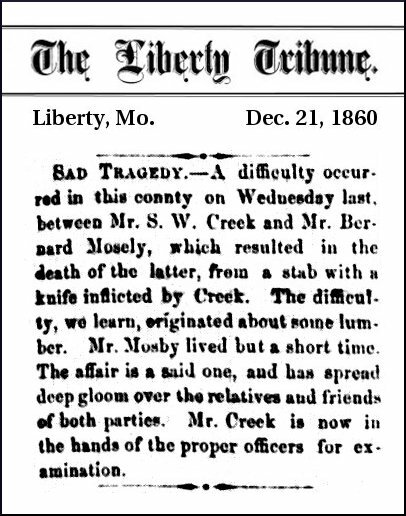 Creek and Mr. Bernard Mosely, which resulted in the death of the latter, from a stab with a knife inflicted by Creek. The difficulty, we learn, originated about some lumber. Mr. Mosby lived but a short time. 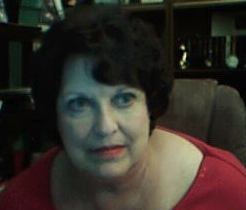 The affair is a sad one, and has spread deep gloom over the relatives and friends of both parties. Mr. Creek is now in the hands of the proper officers for examination. In these times and this atmosphere was Sidney Washington Creek maturing into a young husband, farmer, slave owner and father. His maternal uncle, Henry Washington Younger, was the father of the sons who would become infamous as the Younger Gang. His grandfather, through his many amorous liaisons would sow the seeds that would bring forth his mistress’ Parmelia Dorcas Wilson’s grandsons, the Daltons. The Younger boys would ride with Sid Creek alongside William Clarke Quantrill while cousin Abner Creek and brother Creth Creek would ride with “Bloody Bill” Anderson. The so-called leader of the Confederate group in Clay County treated his duties as more of an avocation than a vocation – showing little spine and even more desultory organization skills. Thus, when faced with the unending thievery, arson and heartless raids of the Red Legs of Kansas, the boys were attracted by the strength and flamboyant style of Quantrill. Cole Younger and brother-in-law John Jarrett would become Quantrill’s right-hand men. Thus, would these dramatic events affect the life of our young man, Sidney Washington Creek, cousin to the Youngers and the Daltons, trusted soldier for the Confederate cause riding with William Clarke Quantrill, one of the most flamboyant and controversial figures in that great and glorious and horrible War.